Bananas – my beanie bag spider monkey from Cairns – not a shy retiring character as you can see – is so bananas about my latest NZ gewürz he had to pose with it before he let me taste. And he was right that little chap! From Hawkes Bay, New Zealand, this dry gewürz has the right amount of fruit sweetness and spice and incredible length. The nose is very generous – fresh, lychee, spice and honeysuckle. It hits the tongue with full-on spice and zing. Rich and soft and mouthfilling with lychee flavours in perfect balance. A long and delicious dry, spicy, gewürzy finish. Oi! Nanas – give it back! 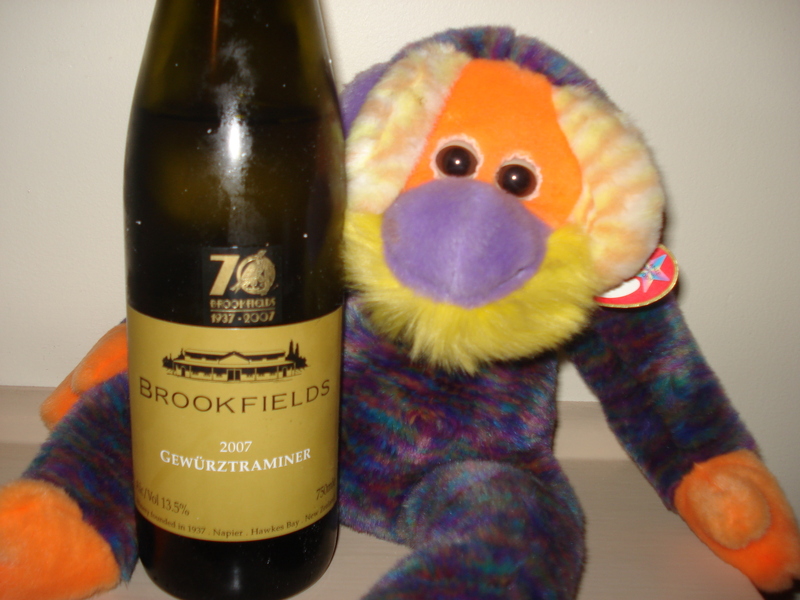 This entry was posted in Gewurztraminer, New World wine, NZ wine, Wine varietals and blends and tagged Brookfields, gewurztraminer, NZ wine, Wine. Bookmark the permalink.